In the face of big-box retail stores owned by multi-national corporations, some Twin Cities area small business owners are banding together to promote shopping at local, independently-owned stores. Supporters of the "buy local" movement say there are many good reasons shoppers should avoid national chains like Target, Wal-Mart and Starbucks Coffee. St. Paul, Minn. — For years many small business owners have complained that gigantic corporations with their big-box super stores have be shutting them out of the market. Multi-national companies selling everything from electronics to construction materials continue to grow, eating up more and more business small stores once counted on. It's a trend that the vast majority of shoppers seem happy to go along with. In the parking lot of the Woodbury Home Depot, Ramone Santana admits he's never really given much thought about where he spends his money. 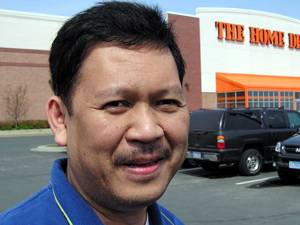 "I don't usually choose whether I shop at a local or a big business like Home Depot right here," he said. It's people like Santana -- who make little distinction between huge multi-national companies and small, locally- owned businesses -- that a group of independent Twin Cities area business owners and consumer activists hopes to influence. They insist national chain stores siphon money out of communities while small businesses strengthen local economies. "This is a big thing, and I really believe that there is an anti-chain and pro-localism movement going on in this country. It's pretty much submerged, but it's starting to grow," says David Unowski. It's been less than a year since Unowski closed his small business Ruminator Books. After more than three decades on Grand Ave. next to Macalester College in St. Paul, Unowski fell victim, in part, to chain store competition. Now, even though he no longer owns his own business, Unowski is helping to organize the emerging Metropolitan Independent Business Alliance. "We hope to educate people about why it's important to have a locally-based economy," he says, "and we will do joint buying, anything from health insurance to toilet paper, and then we hope to have a legislative program so that if cities or the state are giving tax breaks to large businesses or to developers that we get our share." The "buy local" movement is relatively new in the United States. The two-year-old American Independent Business Alliance grew from an effort to promote small businesses in Boulder Colorado which began in the late 1990s. The national alliance's community outreach director, Jeff Milchen, says there are currently a little more than a dozen small business coalitions scattered throughout the U.S., but he says the anti-chain store movement is growing rapidly. "I think we're seeing more and more about communities fighting battles against unwanted big-box stores, chain stores," he said. "And the more that the idea that there are positive pro-active steps communities can take to support their independent business base, the more we're going to see these ideas proliferate." "Buy local" supporters say their biggest challenge is educating shoppers about the benefits of spending money locally. Stacy Mitchell, a senior researcher with the Institute for Local Self Reliance, says there's a compelling argument in favor of spending locally that's convinced shoppers in several communities to more closely consider the stores they patronize. Locally owned businesses recycle a much bigger share of the dollars that they take in back into the local economy. "Most people don't think about these things when they shop, or haven't ever considered what happens to the dollar that they spent at Wal-Mart and where it goes," she said. "But that's part of what we're doing, is trying to bring some visibility to this issue and talking about it. I also think it's an important part of what groups like the newly forming independent business alliance in the Twin Cities can do." Two years ago Mitchell set out to quantify the long-held assumption that buying from independent businesses helps local economies, and that chain stores drain money from communities in which they do business. Eight small businesses in mid-coast Maine cooperated with Mitchell by providing her with detailed information about their finances. She used public information to estimate the operation of a typical big-box store such as Wal-Mart or Target. "What we found is that locally owned businesses recycle a much bigger share of the dollars that they take in back into the local economy. Probably the most significant piece is that locally owned businesses buy goods and services from other local businesses," she said. "So they get their printing done locally, they hire a local accountant. So when you spend a dollar at a locally owned business, that not only goes to support that particular retailer, but it sends this ripple of economic benefits through your community. With a typical sort of big-box national chain, very little of the dollars that they take in actually stay in the local economy. " Mitchell determined that for every $100 spent locally, nearly $54 ended up back in the state of Maine's economy. She says most of it was spent in the county where the store was located. She estimates for every $100 spent at a chain store, such as Target or Wal-Mart, all but about $14 flows out of state, destined for far-off corporate headquarters and various suppliers. Similar surveys conducted in Austin, Texas and in an area of Chicago reached similar conclusions. Most of the money chain stores collect leaves the community, but nearly half of local, independently-owned store revenue is spent again locally. Target, Wal-Mart and Home Depot failed to respond to inquiries about the "buy local" movement and how much of their revenue is spent in the communities where their stores are located. Economist Ken Stone, an Iowa State University professor emeritus, has been analyzing the growth of Wal-Mart since the 1970s. He says it's true that independent businesses spend more money locally. But Stone says simply making that argument is not likely to change shoppers' behavior. "When they see low prices versus shopping at home, and maybe higher prices and less selection and inadequate opening hours and a few things like that, most of them -- and I do mean most -- will make the choice to merely go to where the big-box, discount stores are," Stone said. The local businesses organizing in the Twin Cities say they hope to pool their purchasing to bring down costs, so they can be more competitive with the chains. And former bookseller David Unowski says they're already taking to lawmakers -- whom he will not name -- about what various levels of Minnesota government could do to help small businesses. "We're trying to get a limit on the size, to the footprint of retail buildings in the Twin Cities, because those are the stores that work to drive down the wages, to buy from overseas and kill good jobs in this country," Unowski said. But Ken Stone, from Iowa State, says locking out big-box competition often leads to an exodus of shoppers to the nearest place willing to accommodate a Target, a Wal-Mart or a Home Depot. Stone says that loss of potential customers only hurts local retailers' chances of skimming off business, by offering superior service and merchandise not found in the big stores. "This happens just time and time again. When a community keeps them out, the next community over gets the big-box stores and then people will out-shop the community that doesn't have it to the place where they have it," he said. Ramone Santana, the guy outside Home Depot in Woodbury, says if someone could convince him he should spend more money at local businesses, he would do just that. "If there is information that such and such business is contributing to a community, then I would prefer going to that specific business," he said. Early members of the new Metropolitan Independent Business Alliance are optimistic there are many more people like Santana. The alliance hopes to have 100 member businesses by the end of the year. Organizers plan to introduce a sign for those shops indicating they're part of the "buy local" movement.